Helen Kay is currently researching the work and life of Chrystal Macmillan. In 2014, her work on Chrystal was put on hold when she became the coordinator of an International History Working Group, preparing material for centenary exhibitions on the history of Women’s International League for Peace and Freedom. Why did five women graduates challenge Edinburgh University authorities in 1906? Chrystal Macmillan, Elsie Inglis, Frances Melville, Margaret Nairn and Frances Simpson had the audacity to request voting papers for the Parliamentary General Election under the University Franchise. But to claim the right to vote for the university candidate in a Parliamentary election was considered a step too far and the university authorities refused the women’s request. The men were shocked at the audacity of the women when they pursued their application through the Court of Sessions in Edinburgh and on to the House of Lords in London. The university authorities spared no expense in hiring the best lawyers to represent the universities in court hearings, and when the women eventually lost their case the university claimed costs of £111 14s 3d. 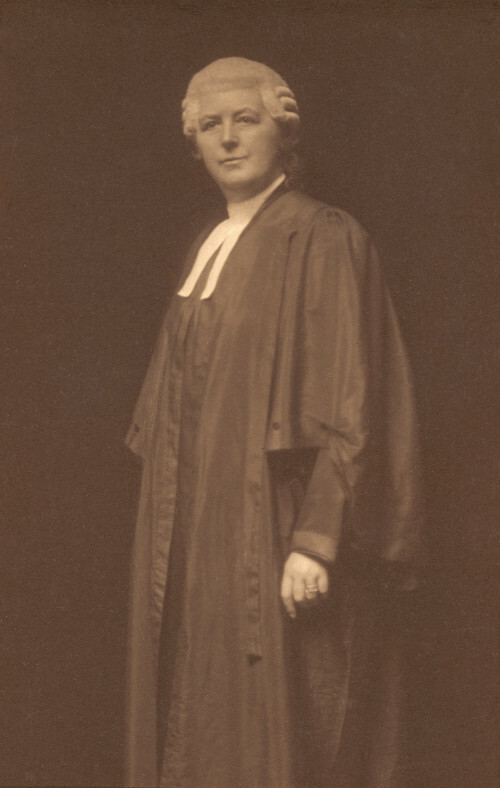 Chrystal Macmillan who presented the women graduates case in the House of Lords in 1908 was a pleasant but dangerous woman throughout her life, continually challenging the established order, trying to improve the situation for women. She campaigned all her life for a woman’s right to full citizenship under the law, in Scotland, in Great Britain and internationally. Her suffrage campaigning took her to all parts of Scotland, from Dumfries to Shetland. Chrystal Macmillan ran the relief office for International Women’s Suffrage Alliance (IWSA) in London. In response to a request from Holland for help in caring for 80,000 Belgian refugees in October 1914, in one day she raised the money and organised a load of food which she and a colleague, Mary Sheepshanks, took to Flushing, breaking the blockade.6 The women travelled extensively in Holland, listening to what the refugees and camp organisers needed, before returning to Britain to raise money for further supplies. Many women in the international suffrage movement were unwilling to join in the patriotic fervour sweeping through Britain, France and Germany at the start of WWI; and in February 1915, twelve women from Belgium, Britain and Germany met with Dutch women to discuss how to maintain their international relationships. Chrystal Macmillan became one of the organisers for an International Congress of Women which met in April 1915. 1200 women from 12 countries chose to face the dangers of travel through war-torn countries to meet in The Hague. With Chrystal Macmillan as chair of the Resolutions Committee, 20 resolutions were passed expressing the women’s horror at the bloodshed, providing an analysis of the causes of war and advocating the use of mediation to resolve international disputes. The Congress elected 5 envoys to take the message to all the Heads of States in Europe and USA, urging them to end the bloodshed and resolve the dispute through continuous mediation. Despite their efforts, no statesman would take the first step toward resolving the war through peaceful methods. The women were not applauded by their fellow citizens for their efforts – in Germany, some women were imprisoned on their return home: in Britain, Millicent Fawcett thought their actions were close to treason: and Chrystal Macmillan’s family refused to talk about her involvement. 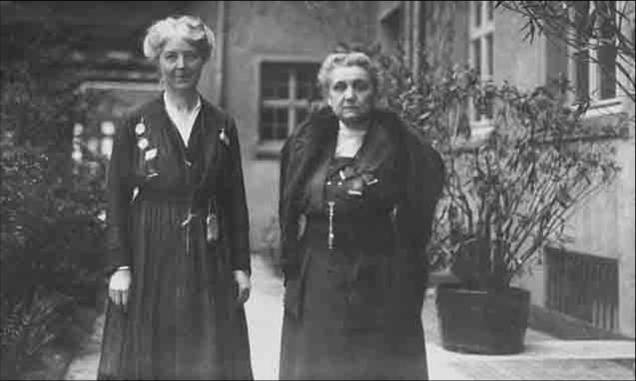 Chrystal with Jane Addams in 1919. From 1916 onwards, Chrystal Macmillan campaigned for a change in national and international law on the Nationality of Married Women. The international legal situation for women who married foreigners was a mess: it was possible for women who married foreign husbands to have two nationalities imposed upon them: some women were left with no nationality, and in practice were left stateless; and others were deprived of all citizenship rights in the land of their birth. When the Government showed no sign of drafting new legislation, Chrystal Macmillan could not accept this lack of action and, in 1921, drafted a document to illustrate what such a legislative change would look like. Two years later she was the only woman called to give evidence to the British Government’s Commission of Enquiry into the Nationality of Married Women. At international level, Chrystal Macmillan showed herself to be equally resolute. A committee member of several Women’s International Organisations, she galvanised an International Demonstration of Women in 1930 and organised a deputation to the League of Nations Codification Conference to promote the resolution ‘That a woman, whether married or unmarried, should have the same right as a man to retain or to change her nationality’. The lawyers and jurists, all men, were meeting in The Hague to discuss international issues of nationality and Chrystal Macmillan wanted to make visible a major problem – the agenda for the Codification Conference made no reference to women, nor any acknowledgement that women’s situation under international law was different from that of men. But by the end of the Demonstration, the lawyers agreed to place the issue on the agenda in future discussions. The Council of the League of Nations proposed to consult women’s organisations in 1931 on the methods of increasing the collaboration of women in the general work of the League. In reply Chrystal Macmillan suggested that the League could employ more women in high level posts in the Secretariat, and could recommend to the States Members of the League that they raise the status of women to that of men, giving women full civil, economic and political rights. Her analysis of the outcomes of gender blindness in the request from The League of Nations is still relevant today.